The Benromach Distillery Company, has today announced the launch of a new limited -edition, 39 Year Old, single cask vintage bottling. Benromach 1977 – Cask 1268 (56% ABV) which was matured in a single refill American hogshead, is said to be a smooth and sweet dram, which delivers notes of ripe banana and passion fruit, with undertones of citrus, dried tobacco and toasted oak. Limited to 225 bottles, this latest release from the multi award winning, Speyside distillery, comes presented in a decanter-style bottle, inspired by the curving shapes and silky textures of the distillery’s copper stills. The bottle nestles inside a rich, dark oak wooden box, reminiscent of the wood used in the original distillery washbacks. 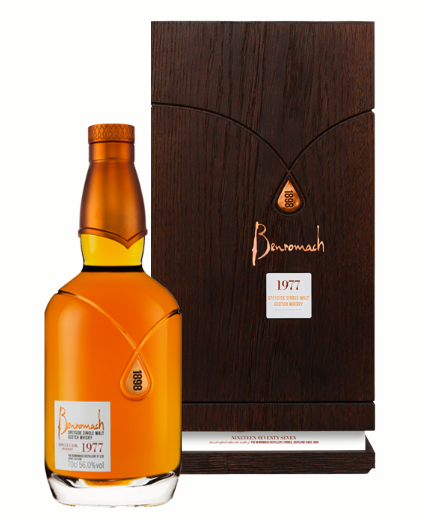 Benromach 1977, will be available later this month from specialist retailers, for a RRP of £1,500,00.